This is our weekly article from the series of posts about eCommerce Email Marketing Best Practices. 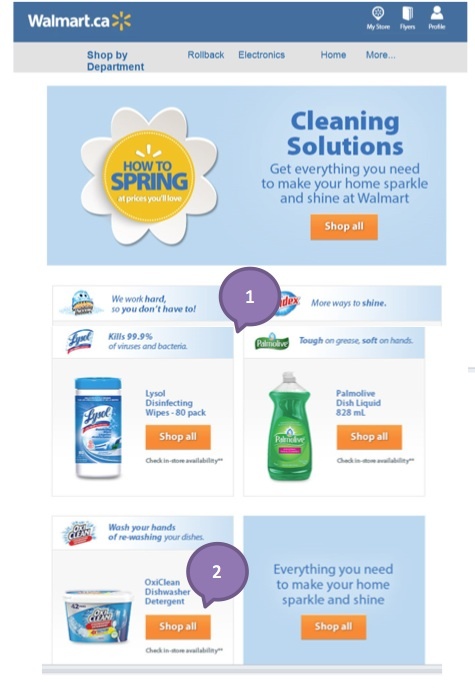 In this weekly spotlight: eCommerce Email Marketing Testing, we review examples of email campaigns from Victoria’s Secret, Walmart and Alex and Alexa. We usually assume that testing of marketing email campaigns is about “fancy” a/b testing or other techniques such as subject line, offers or design testing. In reality, the simple quality assurance for email campaigns often does not get the time or the planning that it deserves. In today’s complicated digital environments when marketing emails are opened with mobile phones, tablets, phablets, as well as desktop computers this topic is crucial. If the email you receive has the best offer, but you cannot read it due to broken layout, incorrect message or broken link, the email will be deleted. All the time spent preparing the campaign will be lost due to poor planning of quality assurance. Always plan to properly test your emails across multiple devices, including mobile and desktop and do not forget testing in Microsoft Outlook. You must allocate at least ½-1 day for QA and fixes for the template you used before and for a brand new template reserve 2 days. It is better to be safe than sorry. The examples we reviewed this week show that even the big brands do not spend the required time and fail to properly review the emails. Marketing managers: the quality of your email is more important than a pretty picture! THIS WEEK WE ARE REVIEWING ECOMMERCE EMAILS FROM THE FOLLOWING RETAIL BRANDS: VICTORIA’S SECRET, WALMART AND ALEX AND ALEXA. is wholly owned by publicly traded L Brands company. Colors: 4* – the nice combination of the brand colors with various spring colors. Opening the email gives you a great feeling that spring and summer are finally here and that evokes positive emotions. Fonts: 4* – good size font that easily read. The pink accent font stands out and is easily recognized. Images: 4*-Good quality images. This brand is known for its beautiful models and it does not disappoint. Great product shots to show how the product can be used, which is great to motivate a purchase. Mobile Optimized: 5*–Email is perfectly displays on mobile. The colors, the fonts and calls to action are nicely visible on the small screen. Subject line: 5* – catchy, clear, provides good information and incentive to motivate the reader to open the email. 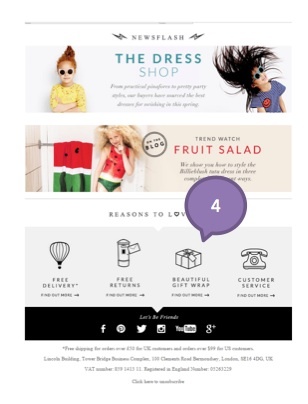 Clear offer: 4* – there is a clear main theme and offer for this email campaign. The other offers are supporting products for the main promotions. Product highlights: 3* – there is no direct information about the products shown, there is a link to the category page, but it needs to give proper information about the specific products shown in the images. This email follows all the great traditional marketing techniques. It has great products, tied with emotional appeal. It is relevant, timely and has urgency to purchase with “limited offer”. Using the positive appeal of long anticipated spring and summer seasons, together with products that look great on the models is a winning formula. The brand targets female audience and this email is generic enough to appeal to a wide age range. The showcased products are also usually refreshed for the season. There are a lot of traditional marketing campaigns that work great and this email shows that it still works today. Walmart is the world’s largest company by revenue, according to the Fortune Global 500 list in 2014, as well as the biggest private employer in the world with 2.2 million employees. Walmart is a family-owned business, as the company is controlled by the Walton family. Sam Walton’s heirs own over 50 percent of Walmart through their holding company, Walton Enterprises, and through their individual holdings. It is also one of the world’s most valuable companies by market value, and is also the largest grocery retailer in the U.S. In 2009, it generated 51 percent of its US$258 billion (equivalent to $284 billion in 2015) sales in the U.S. from its grocery business. 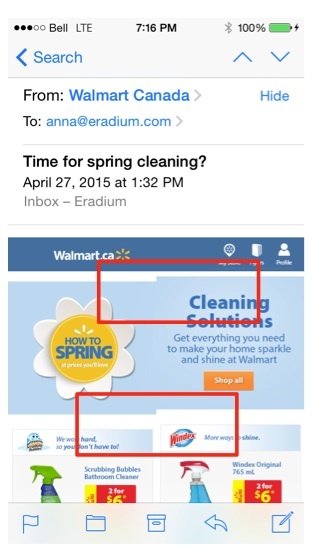 Subject Line: Time for spring cleaning? Colors: 3* – there is not enough color and contrast in the email. The email is missing the bright colors of spring in order to be true to the subject line. Fonts: 3*– the fonts blend in with the overall whitewashed look of the email. They need to be bigger and more prominent in order to call attention and be effective. Images: 3*– the images appear fuzzy and not sharp. Formatting: 2*- Appears messy and not aligned as if all the blocks are floating independently of each other. Mobile Optimized: 2*–I am including the shots of how the email appeared on mobile. The blocks do not align properly and the footer is completely distorted. Product highlights: 3* – it is the confusing user experience since some products link to categories and some directly to product pages. The look of the product and category blocks is not very different. It feels as a user you do not know what you will get once you click. This email appears to be very poorly made for a retailer of this magnitude. It looks like an email that would come from a small, local store. It is clear that this email was not tested at all on the iPhone. It is inexcusable that a retailer of this size cannot create a proper footer in a template that they send on a weekly basis. This particular email design is not appealing on any level, emotional or practical. There is nothing worse than receiving a broken email from a big name retailer on items that you can buy anywhere, it just sad. 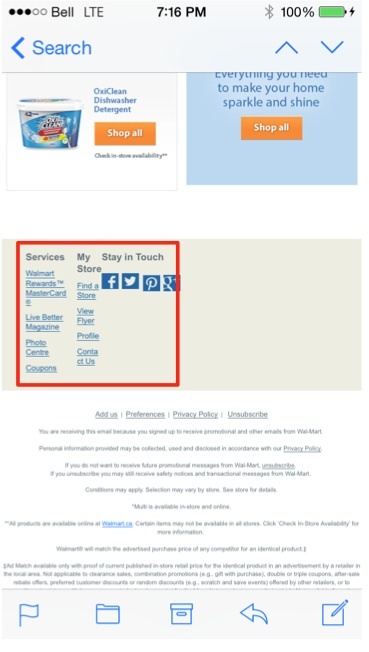 Walmart please invest the proper time to test at least your main template that you send on regular bases on the most common mobile device. Colors: 4*-there is no dominant color in the email; it is the white background with a gray block. All the products, however, have different colors that complement the overall look. Fonts: 3* -the fonts are a bit fuzzy and small. They are not sharp enough to be easily read. Clear offer: 4* – greatly put together products. The entire email centers around shoes for the summer. They include both boy and girls shoes. They also cover the different types of shoes you will need in the summer time. The other 2 offers compliment the main topic nicely with additional products you might need in the summer. Urgency to purchase: 2*– there is no urgency to make a purchase. There is no start or end date, there is no discount. This is more of “information” email about the shoes available in the summer. It is more for someone who did not know such shoes existed vs the discount shopper. Great looking and creative email campaign will capture a wide audience. Since this email is not targeted, this kind of offer and presentation is quite effective alternative. It covers relevant products that will appeal to majority of parents. It is also thought provoking since it serves as an education on various types of summer shoes. It will defiantly promote interest and click through as parents will want to learn more. Combining creativity and practicality is a great way to engage the consumer. This is an actual email that I have received from one of the biggest companies in North America, this is no joke. How something like this can happen? Information leak prior to launch is a pretty big deal. How can I now trust this brand with my personal information? 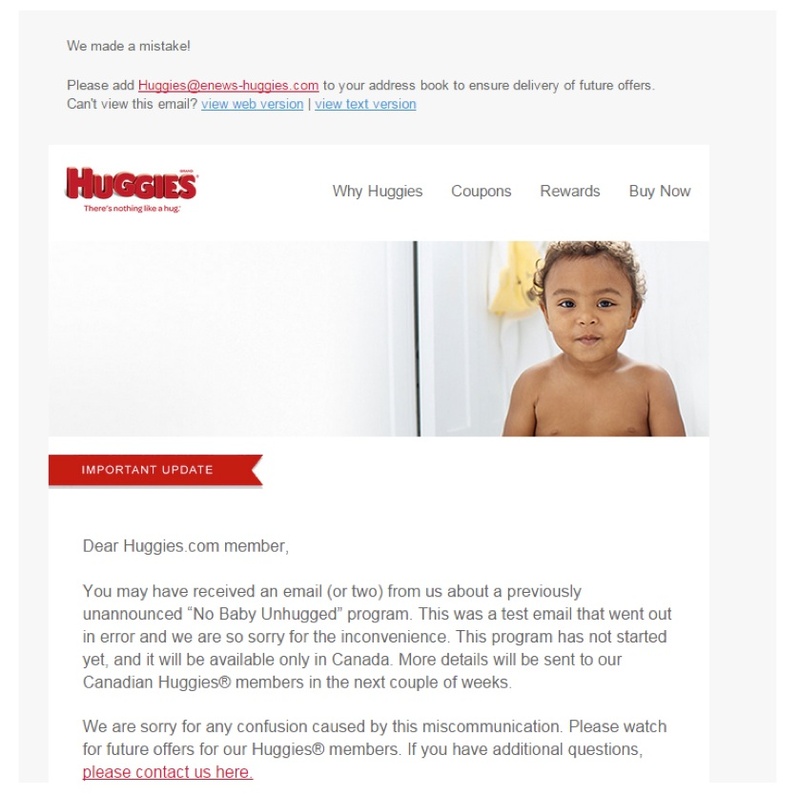 The brand must do major damage control, sending a sorry email will not cut it. You need to send free offers as well as assurance that my data is safe and the problem was resolved. Mistakes like this should not be viewed lightly into today’s always connected information. Companies must be held responsible if they collect your data. Create a list of test accounts; include various domains such as Hotmail, Google and Yahoo. Make sure you send the test email only to the test accounts, triple check. Always check the email at least on the newest iPhone and Android. Testing with screen emulators is not enough. It is strongly recommended that you allocate sufficient time and resources for all your marketing emails. 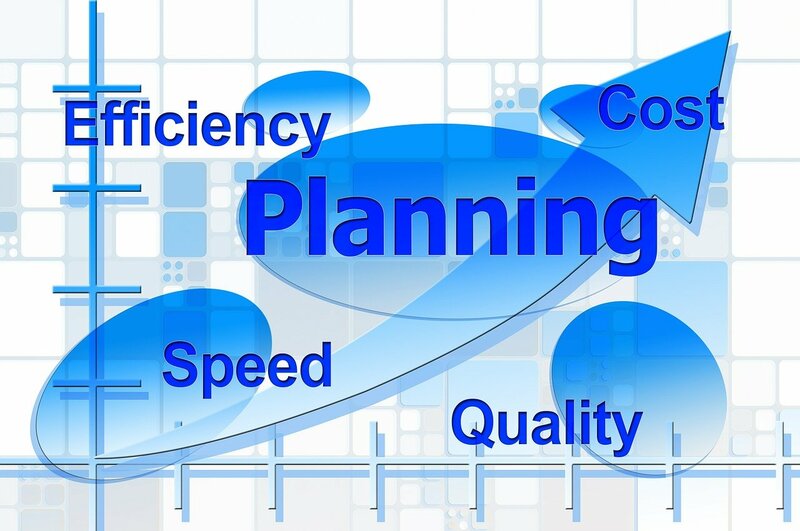 Set up systems and QA processes in place to eliminate mistakes, and if they do happen proper damage control procedure must be executed in timely manner.